OK, so I’m deep into the middle of a move (from Canberra to Sydney). The good news is that we’ll be opening an actual Blue Manchu office in Sydney so that is likely to accelerate development of Card Hunter. The bad news is that I don’t have a lot of time for writing diaries this week (and maybe next week as well). 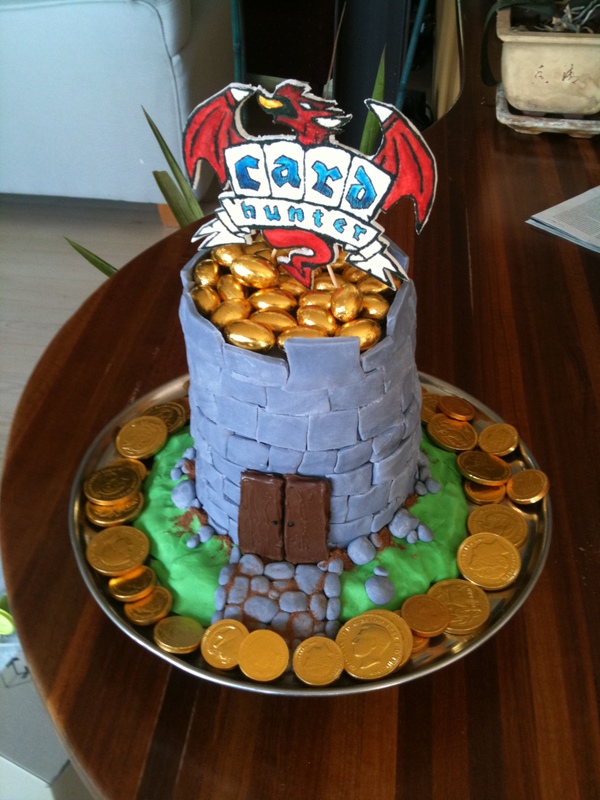 Yes, it’s a Card Hunter cake, complete with dragon, eggs, a keep and treasure! For the curious – it’s banana cake underneath all that fondant. And, yes, it was delicious. lol I was expecting some cake-themed adventure or card in that post somewhere. I was hoping it was gonna be for the beta announcement. Can we order one of those? Looks incredible. THough its a shame that the studio won’t be in Canberra. With Jon moving I might rename my work space Blue Manchu Canberra. I’d put a sign on the door, but my office doesn’t have one. Your new title will be Vice President and General Manager, Canberra Studio. Who will be President of the Canberra Studio? I have an upstart pot plant named Quincey who’s bucking for a promotion. A couple of months ago in your FAQ page you said that the game would be play to win rather than pay to win ( with paid extra contents but that is just normal ). Now, you erased that sentence from your FAQ, did you change your minds ? Because if you changed your philosophy…. That’s just… Sad ? ! The game will be free to play. There will be an in-game store where you will be able to buy items that enhance your game experience. More details will be announced as we progress. Some free to play games are designed that way, but our model is that we want to provide you a great free experience with the option of purchasing stuff if you like the game and want to enhance your experience. We are striving hard to make sure the game isn’t “pay to win”. As far as I recall, we haven’t changed any of that since I posted it. Is there some specific text that you recall? It has been a while since the last post, How is things going?